Last night I was at the farewell concert of a choir that my love used to sing in. Somewhere around 2002 some mothers of the school of our children came up with the idea to sing together. Most of them never had never been in a band or a choir before, but one mother is a classical singer and she became the leader of Mazanko, as the twenty woman called their choir. Later a pianist and arranger was added to the choir, and what began as just fun resulted in a first concert in 2003. They rented the local church and invited all family and friends. Some of the women couldn’t sleep from the idea that they had to sing for an audience. I am not a shy person, and I tend to forget that some people are, and often in ways that make their life very difficult. But the concert was a success. I was surprised: not only because the choir sang very well and because close listening to certain songs always touches me, but also because the joy and pleasure of singing was made audible that night. Mazanko gave several other concerts since then, and technically the choir became better and better, but the magic of that first concert could never be repeated, of course. 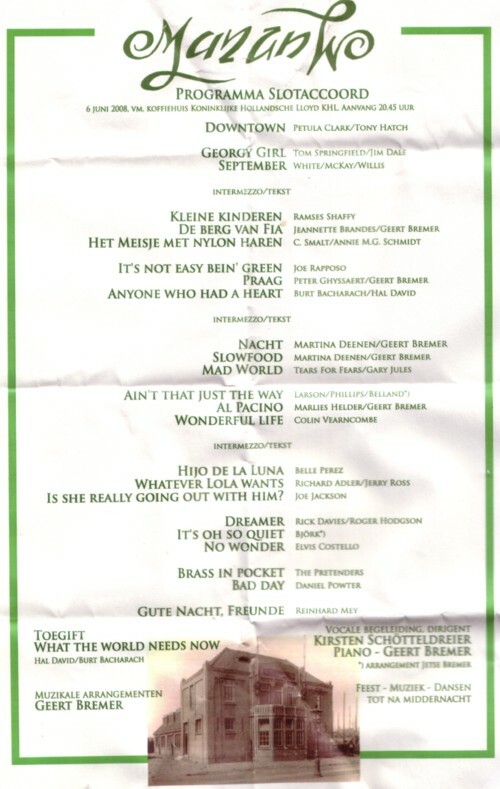 Mazanko sang a very mixed repertoire of pop songs from all era’s and in several languages, as you can see on the program of last night’s concert. Half of the first time members quit the choir in the last year, but new members were attracted and last night it was clear that Mazanko was still doing more than okay. And now it is over. Here is from an early concert a song that I taped with my old mini-disc recorder: ”No wonder” , a song from Elvis Costello.